Sorry, it’s been so long since I have posted one of these. I know I mentioned that I would post one once a week, but since it has been a month since I last posted a tip I guess I wasn’t able to keep to it weekly. With Christmas and then just family things and then of course work I just didn’t have the time to sit down and write a tip. However, now I’m back and hopefully I can start posting these tips once a week again. But I think for now I’m not going to make any promises for that. So in my last cross stitching tip post I said I would do a post about ironing your piece of cross stitching. Now of course with all the time in the hoop your piece doesn’t really look flat anymore and if you did try framing it, it might not turn out exactly the way you want it to look. Ironing is the perfect way to get rid of all the ridges and curves the hoop made over the time of you stitching it. Now I’m not sure where I read this, but I read somewhere that putting wax paper between the iron the cross stitch piece was a good idea. Please, do not do this. All that happens is that the wax gets on your iron and it sticks to the iron. Luckily for me, I found what was happening before I completely destroyed my iron and maybe even my piece of work. So anyway what I do(now everyone has a different way of doing something and I’m not saying this is the best way just that it worked for me.) is have the iron on the lowest amount of heat possible that way you won’t risk burning everything. Next, all I did is iron over the piece very carefully, but on the back side of the piece, because I didn’t want to flatten any of the threads just want to get rid of the creases. Well, I hope this helps some of you and if you have a different way of ironing please feel free to make a comment and share. I would love to here from other cross stitchers. Thanks and happy cross stitching 😀 ! So I know that I have already done a framing one for you guys, however this time it is actually putting your work in a really frame. Once your piece is ironed flat, center your piece on a cut out piece of cardboard of your choice of size, just make sure there is some space alone the edges so that you can fold them over. Me I liked to use tape so that when you flip it over and you realize that it isn’t in the right place you can just take the tape off and fix it to your liking. For the corners I folded the ends inside to make a triangle so that there for sure wouldn’t be any fraying sticking out. Then all you have to do is tape it down and put it into the frame of your choice. Side Note: It works better to buy the frame first and then cut the piece of cardboard to the site of frame then to put your piece on so that you know for sure it is going to fit in properly. So my last project “Friends are Close at Heart” was supposed to be in an actually frame with glass, but when I was putting it in the frame snapped. Which really sucked. I think the frame I used in the picture above was much better for the piece though. All it is, is a piece of wood cut to the right size and then the edges are wrapped around and then stapled to the wood. For a hook you just have to go buy what is called: “framing hook”. 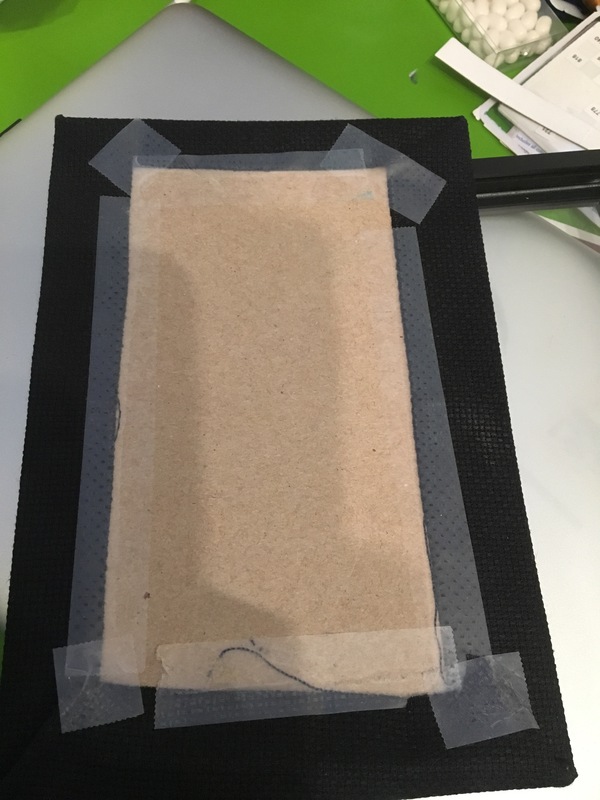 It comes with two loops that you screw into the wooden board on either end, a wire that you twist into each of the loops (now the wire is going across the wooden backing of the frame), a hook, and finally a nail so you can hang it on the wall. I really liked this kind of framing and would diffently do it again. Well everyone knows this: French knots are hard to get the hang of, or even if you can get the hang of them you still find that they don’t seem to look that nice. I have this problem too, even though I have been a cross stitcher for five years now (well an estimate). So I decided I would share with you guys my little trick to avoiding french knots. Don’t worry its really easy and it isn’t a new stitch to learn. All you have to go buy is seed beads. Use a seed bead on your fabric where you would have a french knot. I have decided to start putting on some cross stitching tips on my blog. I have been cross stitching for a few years and I believe I have some neat or at least handy ideas for when you are working on your projects. I might not be posting them all the time, as you can see I don’t post much on here. Which does have to do with trying to find time to work on projects and then also trying to find time to actually post the projects down on here. But anyway I would like to have one tip each week or at least one every second week, which I think is not too much work and it doesn’t take too much time to write down a tip and share it with you guys. So tomorrow I will be posting the first tip, so of you miht already know about it, but if you don’t I hope that you will use it in your next project.